Country singer Tim McGraw was forced to cut his set short Sunday when he collapsed onstage while performing in Ireland. The country star was performing his hit song “Humble and Kind” in Dublin when he suddenly slumped to his knees. The spotlight on the venue was quickly turned off, as staff and the band assisted McGraw off the stage. 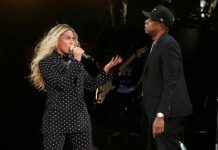 “I thought he was taking in the applause while sitting down after singing ‘Humble and Kind,’” said audience member Del Crookes, who found the singer’s collapse as a shock. After around 20 minutes, McGraw’s wife, fellow country star Faith Hill, with whom he was touring, went onstage to address the waiting crowd. She apologized to the audience and announced that McGraw could no longer continue with the performance. McGraw and Hill were co-headliners of the Country to Country festival in the United Kingdom, which saw them perform in three countries in three days. They had performed Friday night in London, Saturday night in Glasgow, before taking the stage Sunday night in Dublin. “We’ve all been a little bit dehydrated, traveling so much,” said Hill. The couple is scheduled to begin their 29-city Soul2Soul tour in the United States on May 31. The tour will kick off in Richmond, Virginia.